Eugene's new pod in Kesey Square downtown. Hopefully this fair-weather, intermittent blogging will become more regular again, now that my spring classes have come to an end. Plus, after one of the rainiest June’s yet, it’s finally sunny in Oregon, so I have no excuse not to write about the bounty finally revealing itself in our gardens and farms. Now we have the al fresco dining scene to look forward to, too, and what defines outdoor eating more than mobile food carts? Portland is world-renown for its ubiquitous carts and Eugene is trying to grow its base of them. 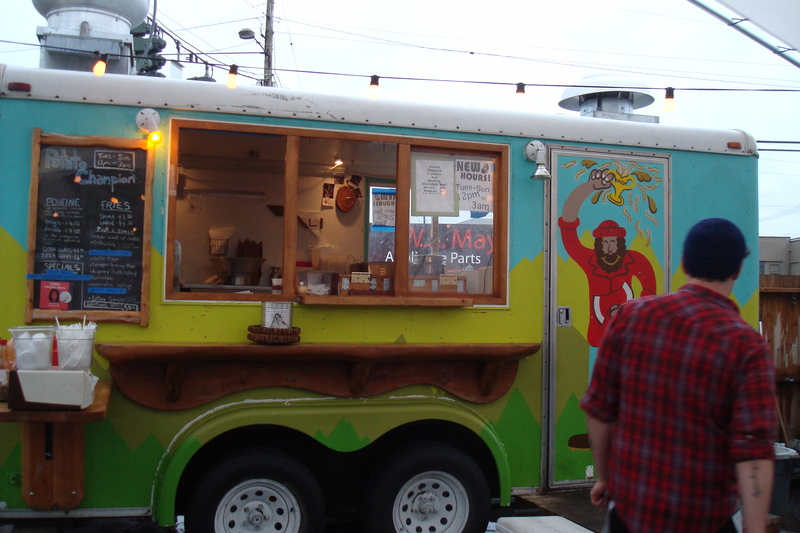 Even in Salem and Bend have food carts. But restrictive regulations means Corvallis has next to none, apart from those who vend at our two weekly farmers’ markets. But folks, including a local crepe stand, are hoping to change that. I plan to follow the issue for KLCC. There in Eugene today for a news meeting, I ventured over to the new pod for lunch. My indulgent Cuban sandwich (with braised local pork belly) from The Nosh Pit lived up to its reputation. For you stoners out there, on late nights the cart even plans to serve a burger on a glazed cruller from the new Voodoo Donuts just ’round the corner. Dropping by Voodoo everytime I’m at KLCC could become a bad habit I start justifying out of love for my husband. The Neapolitan one I had today (old-fashioned chocolate cake doughnut topped with strawberry sugar and marshmallows) could become a new favorite. 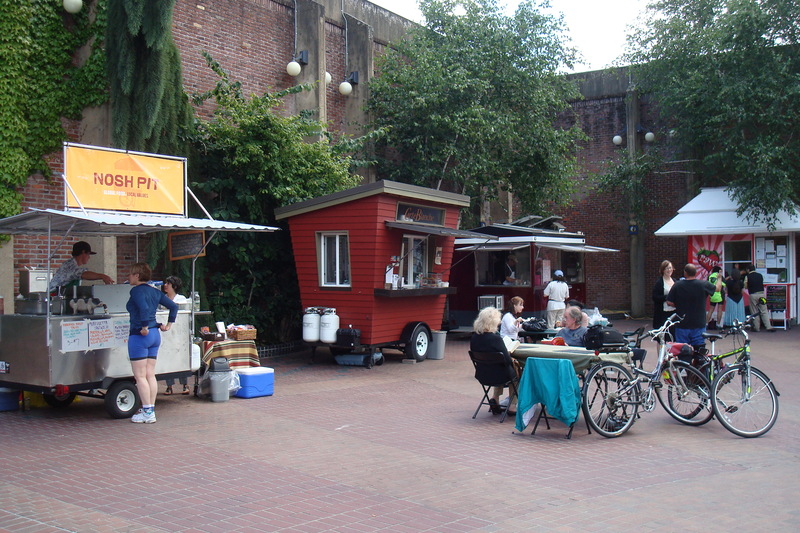 Speaking of fatty food cart fare, look no further than to the SE Hawthorne pod in Portland. 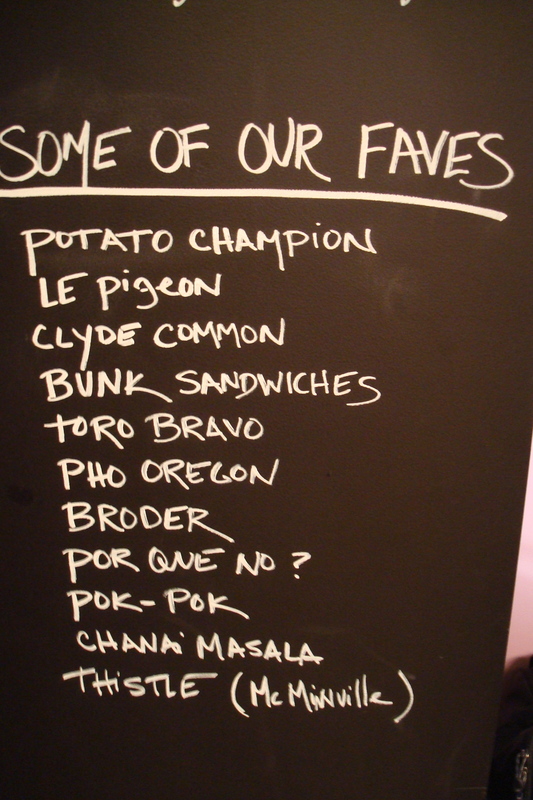 I had wanted to try Potato Champion ever since glimpsing on a chalkboard list of favorite spots at Naomi Pomeroy’s Beat. But I was underwhelmed. Maybe I didn’t order right, getting the PB&J (Thai peanut and raspberry sauce), which sounds gross as I retype it now. Next time I’ll try the poutine or a truffled or anchioved sauce. Then for dessert there’s the neighboring Whiffie’s fried hand pie cart, the winner of the Willamette Week’s Eat Mobile fest this year. I prefer my fat calories for in the form of fries. But the savory-sweet Hawaiian ham and cheese was a nice savory-sweet compromise. 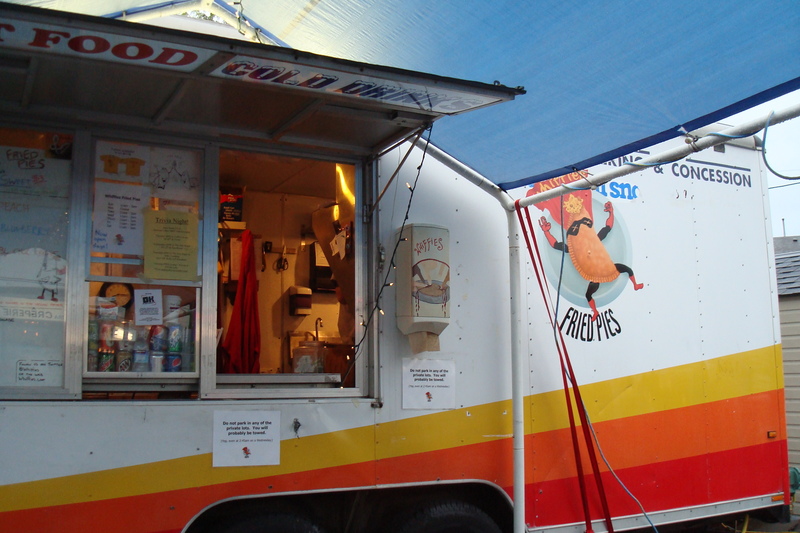 Fried food rules here: The famous Potato Champion cart in Portland's SE Hawthorne pod. Don't forge the fried hand pies at neighboring Whiffie's.